Having a central heating system that you can rely on is essential to keep your home feeling warm and comfortable. As a family-run firm with many years of providing central heating installations in Chapel Allerton, here at Tuke Heating we’re proud of our excellent reputation for reliability, professionalism and friendly service. Buying a new central heating system is a major expense and we know that installing a new heating system can be a daunting experience for many homeowners. Whether you would like to update or replace your existing heating system or want to install a brand-new system from scratch, we’re happy to offer free and unbiased advice and information on the best system for your home. Our services are available to residential customers, businesses and landlords and if you’re looking for a central heating specialist in Chapel Allerton, look no further than Tuke Heating. We promise to offer a friendly yet professional service on every job – no matter how small. When you contact us we’ll arrange an initial visit by one of our qualified, experienced Gas Safe Engineers who will assess your heating requirements and talk through the options available. All properties are different and when it comes to central heating, what is best for one household may not suit another. This is why we spend time with all of our customers to find the most appropriate central heating system to suit both their budget and lifestyle. 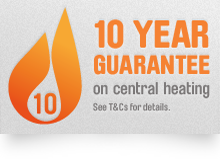 We pride ourselves in offering unbiased, realistic advice on the different central heating systems and boilers which are currently available. At Tuke Heating we are fully accredited and approved central heating and boiler installers: we can install, repair and service most makes and models of boilers. We can supply and fit Worcester Bosch boilers which have an excellent reputation for reliability and come with an unbeatable warranty of up to ten years. So why choose Tuke Heating? We are a family run, local, established business with a reputation for offering reliability and exceptionally high levels of customer services. From the start of every job through to the finish, we work hard to make sure our clients are 100% satisfied with every single aspect of our service. If you would like further information on our installation, repair and servicing for central heating in Chapel Allerton, please don’t hesitate to get in touch. And its not just Chapel Allerton; we also offer our central heating services in other areas including Bramley, Cookridge, Guiseley, Harehills, Hawksworth, Headingley, Horsforth, Kirkstall, Meanwood, Menston, Roundhay, West Park and Woodhouse.